We live in an uncertain world with constantly fluctuating markets and changing needs. With opinions coming from all directions, you may have a hard time confidently deciding what will work for your situation. Every person is unique and has their own definition of financial independence, which means no one strategy fits all. 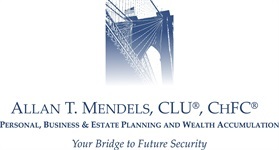 At Mendels & Associates, our goal is to BRIDGE the gap between where you are today and where you want to be in the future. We ask the questions that many people haven’t considered before and help you gain clarity about your financial situation and vision of success. Utilizing a holistic approach that addresses all elements of your financial picture, and with access to some of the top CPAs, Attorneys, and other professionals across the country, our mission is to help you create a BRIDGE that guides you toward financial well-being. We serve as your lifelong financial professional. It’s not uncommon for us to work with families through multiple generations. With more than 47 years of experience and a “soul” purpose to serve you with all your financial needs, we aim to stand out from the crowd of financial services firms. Based in South Orange, New Jersey, we serve clients in the greater New York City area, as well as across the country to California. As a virtual firm, we have the ability to work with clients in-person, via web-based meetings, and over the phone. Let us serve as the quarterback of your team of professionals, simplifying the process and providing education and guidance for the long-term. Contact us.